Geological texture of Lena Pillars contains outstanding evidences of the Earth and its living population development history. Numerous fossils of ancient organisms found here are unique preserved evidences of a very important stage in the history of the organic world and a biodiversity "boom", that occurred in lower Cambrian epoch. 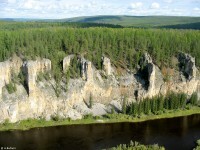 Also in Lena Pillars area the fossils of mammoth fauna representatives were found: mammoth (Mammulhus primigenius Blum), bison (Bison priscus Boj), fleecy rhinoceros (Coelodonta antiguibatis Blum), Lena horse (Eggus lenensis Russ), Reindeer (Rangifer tarandus L). 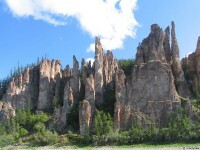 On the territory of the Park there is a wide diversity of frozen ground relief (frozen ground karsts, silt pinnacles, bulgunnyakhs, up-warping knobs, polygonal-veined ices). On the right bank of Lena one can see small areas of fluttering sands - "tukulans"; it's a unique landscape with some elements of a cold northern sandy desert. In general, there are 464 species, 276 genera and 81 families of vascular plants. It's the only area in the world where the endemic inhabitant Redowskia sophiifolia can be met. 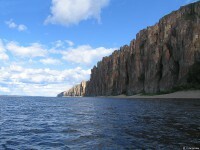 Besides, in the area of Lena Pillars one can meet 12 more Red Book species. 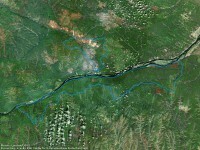 Area is characterized by a specific combination of fauna complexes. 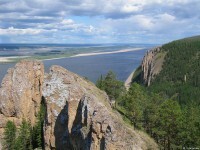 Together with dominating forest elements, the representatives of mountain-taiga (Siberian musk deer, red deer) and mountain-steppe (brown creeper) complexes are met here. There are 42 species of mammals in the Park. The fauna of breeding birds is represented by 99 species, 27 species are included in the Red Books of different levels. Bewick's swan, peregrine falcon, gyrfalcon, white-tailed eagle, golden eagle, osprey and sterkh are included in the Supplement to the CITES Convention, they also are protected species of the world avifauna. 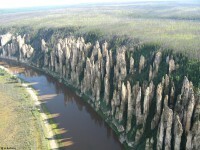 Lena Pillars are extremely beautiful; their aesthetic influence on people has no comparison throughout a huge territory of Eurasian North-East. Fantastic stone statues, resembling strange-shaped pillars, spires, bayed towers, crossings and caves, stretch along the rivers' banks for tens of kilometers. 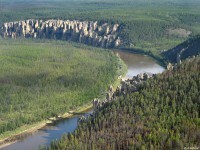 Booklet "Lena Pillars Nature Park - Potential World Heritage Property"
Nomination "Lena Pillars Nature Park"